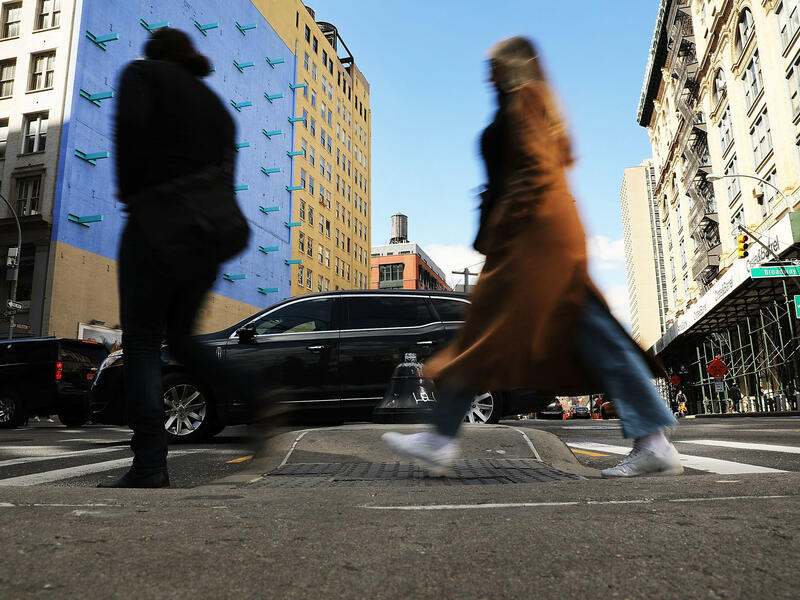 Pedestrians walk along a Manhattan street in New York City in March. A new report finds that SUVs are increasingly involved in fatal crashes with pedestrians. During that eight-year period, the number of such crashes involving SUVs increased by 81 percent. "The average annual increase in crashes involving SUVs was 3.1% higher than the increase in other vehicle types combined, and the difference was significant," the study's authors wrote. The study comes from the Insurance Institute for Highway Safety, a nonprofit organization that's funded by auto insurance companies and associations. Its mission is to find ways to reduce crashes and the losses that result from them. The report notes that SUVs have increased in popularity in recent years, according to U.S. vehicle registration data: "the number of registered SUVs increased 37% from 2009 to 2016, while the number of other registered passenger vehicles decreased by less than 1%." Trucks and SUVs now make up 67 percent of the U.S. auto market, according to Automobile magazine. "Although larger, heavier vehicles provide more protection to their occupants and thus have lower driver death rates per registered vehicle than smaller cars," the insurance report says, "previous research has found that SUVs and other light trucks and vans were associated with increased risks of severely injuring or killing pedestrians in an impact when compared with cars." Part of what makes SUVs so deadly to pedestrians is their design, the institute explains: SUVs' front ends are higher and often more vertical, so they are more likely to hit a pedestrian in the head or chest, rather than the legs. While pedestrians 70 and older are the most likely to be killed, the highest increase in per capita pedestrian death rates was among adults 20-69. It's not yet clear what accounts for that increase, but the authors note that it could be simply that adults in this age range are walking more: "the estimated number of Americans who reported walking as their primary method of commuting to work in the past week increased from 3.3 million in 2005 to 4.2 million in 2015." Cars moving at faster speeds make for deadlier and more frequent crashes, and speed limits have been going higher and higher. Road design also plays a major role in pedestrian deaths. The most typical pedestrian fatality occurs midblock, on an arterial street, in the dark. Phoenix and Albuquerque topped the 2016 list of cities over 500,000 people with the highest per capita pedestrian fatalities. Detroit also was also high on that list. "As a Detroiter, I can give you a few reasons why: crumbling infrastructure, poorly designed public spaces and poverty," Erin Marquis writes at Jalopnik. "Detroit is a poor city built with multilane surface streets cutting through it, even in the heart of downtown, with barely any crosswalks. Jaywalking across five lanes of traffic on streets with little to no illumination is something of a pastime here." Road diets are one way to make the streets safer for walkers, by narrowing the distance required to cross, and slowing the speed of vehicles. Median crossing islands, curb extensions, and pedestrian-activated beacons can help, too. The institute notes that making changes to vehicles can also make them less deadly to pedestrians. Approaches include making vehicle fronts softer, headlights brighter, and adding rearview cameras that can prevent crashes in which drivers back over pedestrians. Another strategy is adding pedestrian airbags that inflate if the car hits someone. The airbags are meant to protect the pedestrian from striking the front roof pillars, which can be especially deadly. Volvo announced pedestrian airbags on one of its cars for the European market in 2012, and in December GM said it had been issued a patent for a "fender-located pedestrian protection airbag." Mercedes-Benz has filed a patent for its own pedestrian airbag design.